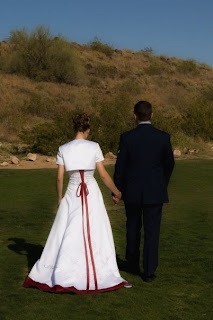 The Adventures Of the Olson Clan: 5 years! Seems like just yesterday we were just dating long distance. Time defiantly flies. So 5 years ago we got married. We got married at my hometown church in AZ. Then we had a mini honeymoon. Mini as in a few days at a local nice resort. Then we packed the car and Josh headed to our new future to South Dakota our first military assignment. I stayed behind, since I had one month left of college. Finished my last exam, got my degree. And headed out with my friend Laura to South Dakota. The start of our adventure. That has lead us through living in a new state, going through snow storms, having our son, two deployments and then our recent move to a whole new country. I cant imagine having anyone else by my side than my best friend. Im so greatful for my husband. And also for the life he has made for us. I know he works hard for the things he provides. He makes me laugh every day and always makes me smile. He is a good dad. And Ethan loves hanging out with him. I could go on and on. But I know I am very lucky to have my husband. I am excited to see what new chapters will come our way. As time passes Im glad I will have my best friend there by my side.